3/9: Give That Dream Some TIME! Give That Dream Some TIME! Don’t give up on your dreams too quickly. Stop thinking that just because something didn’t happen right away it won’t. Stop second guessing your heart, your spirit, your true wishes and heartfelt desires. There’s something called Divine Timing at play in everything we dream. Divine Timing means the Universe is working behind the scenes to bring what our vibration says our dreams are into alignment. This may mean bringing you a needed insight, message, piece of information, or lead. It may mean that other people’s shifting needs to take place to get them out of your way, or into your life. It may mean the Universe isn’t quite ready for this dream to happen for you quite yet. Or that something better is aligning for you instead. Or it may mean that you haven’t done the work, the clearing and shifting you need to do to be able to vibrationally hold on to this thing you want, when it comes to you (that’s where I can help, by the way. I am a truly gifted Energy Untangler). Just because something hasn’t happened yet doesn’t mean it can’t or won’t! Your timing and Divine Timing are not always the same! Your job is to hold on to that dream. The Universe’s job is to match your energy (that’s the Law of Attraction). Keep dreaming it, keep focused on what having it would bring to your life, keep visioning having this dream become real, and trying it on in your imagination. 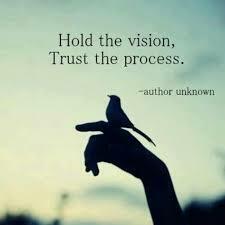 Give your dreams some time and see what unfolds as you hold that vision. This or something better, whatever is in line with the Universe.